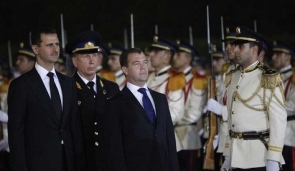 Russia President Dmitry Medvedev, right, and Syrian President Bashar Assad in Damascus, May 10, 2010. Syrian official says Damascus agrees ‘in principle’ to allow entrance of Arab League observer mission; 22-member body proposed sending hundreds of observers to the to help end the bloodshed. Russian warships are due to arrive at Syrian territorial waters, a Syrian news agency said on Thursday, indicating that the move represented a clear message to the West that Moscow would resist any foreign intervention in the country’s civil unrest. Also on Friday, a Syrian official said Damascus has agreed “in principle” to allow an Arab League observer mission into the country. But the official said Friday that Syria was still studying the details. The official asked not to be named because the issue is so sensitive. The Arab League suspended Syria earlier this week over its deadly crackdown on an eight-month-old uprising. The 22-member body has proposed sending hundreds of observers to the country to try to help end the bloodshed. The report came a day after a draft resolution backed by Arab and European countries and the United States was submitted to the United Nations General Assembly, seeking to condemn human rights violations in the on-going violence in Syria. Jordan, Morocco, Qatar, and Saudi Arabia were among Arab states that joined Germany, Britain, and France to sponsor the draft submitted to the assembly’s human rights committee. In Washington, State Department spokesman Mark Toner said the U.S. would sign on as a co-sponsor of the resolution. The draft demanded an end to violence, respect of human rights and implementation by Damascus of a plan of action of the Arab League. The move comes as clashes escalated in Syria and after Russia and China used their veto in October to block a Security Council resolution that would have condemned the Syrian government of President Bashir for the violence. Such a veto is not applicable in the 193-nation assembly, which will consider the issue after the human rights committee reports back to it. The UN says more than 3,500 people have been killed since unrest erupted in spring against Assad.